Cinco De Mayo is day for partying — one of the biggest party days of the year for the people of Mexican descent. But, just as you don’t have to be Irish to celebrate St. Patrick’s Day, you don’t have to be Mexican to celebrate Cinco De Mayo. With the huge Hispanic population in southern Chester County, Kennett Square is the perfect location for a Cinco De Mayo Celebration. “Cinco De Mayo” (The Fifth of May”) commemorates the defeat of the French army by the Mexicans at The Battle of Puebla in 1862. On May 5, 1862, over 6,000 French soldiers tried to capture the forts of Loreto and Guadalupe in Puebla de Los Angeles, Mexico. Led by General Ignazio Zaragoza, 2,000 Mexican men fought back hard and held the fort. 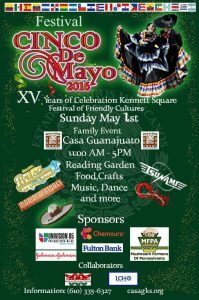 Kennett Square’s Cinco De Mayo Celebration (http://historickennettsquare.com/events/cinco-de-mayo-2016), which will be held on State Street and Broad Street from 11 a.m.-5 p.m., is a celebration of Mexican culture. The free event features authentic Mexican food, music, entertainment and children’s activities. The festival has been sponsored in Kennett Square since 2006 by Casa Guanajuato, a group promoting Mexican culture. One of more than 50 kindred organizations across the USA, Casa Guanajuato derives its name from Guanajuato, a state in Mexico that is the original home of many of the Mexican immigrants in the area. The event is co-sponsored by Univision65. 2016 Kennett Beautification Plant Sale will take place at Genesis Walkway on April 30 from 9 a.m-4 p.m. and Art on the Square 2016 South on Broad Street from 10 a.m.-5 p.m. on April 30. “Sheep and Wool Day” is Saturday at Springton Manor Farm. “Sheep and Wool Day” at Springton Manor Farm (860 Springton Road, Glenmoore, 610-942-2450, www.chesco.org/ccparks) is an event that has grown into a spring tradition in Chester County. 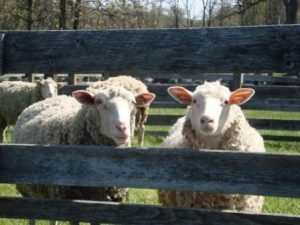 This year’s “Sheep and Wool Day” is a free family event that will be held on April 30 from 11 a.m.-3 p.m. Visitors will be able to observe demonstrations of sheep shearing along with weaving and spinning demonstrations. The well-attended annual event will also feature a crafts area with family games, wagon rides, farm displays, face painting, a corn crib, artisan displays, kids’ crafts and period games and more than 20 food and craft vendors. The Pennsylvania Farm Bureau’s Mobile Agriculture Education Science Lab will offer hands-on learning about food, farming and other agriculture-related products. Visitors can also check out the young animals in Springton Manor Farm’s Great Barn and tour the Agricultural Museum to learn about seasonal tools used on Chester County farms from the 1700s to the 1900s. The Chester County Master Gardeners will hold a plant sale with vegetables, herbs and native plants, and the Chester County Food Bank will showcase their partnership with Springton Manor with its onsite Outdoor Classroom. There will be displays and demonstrations presented by Penn State Extension, 4-H Clubs, the Chester County Food Bank and Grist Mill Farm Alpacas. Throughout the day, Ridley Creek State Park’s Colonial Pennsylvania Plantation will demonstrate butter making, spinning and dyeing. There will also be demonstrations of spinning, weaving and knitting by Lancaster Spinners & Weavers Guild and Purls of Wisdom, rug hooking with Brandywine Rug Hooking Guild and knitting and crocheting with Crochet One, Knit Too! Live entertainment will be provided by the Folkie Dolkies Band and juggler Randy Lyons. Items for sale by craft vendors include jewelry, bird houses, soaps and lotions, felt and wool products, jellies, photography, tote bags and more. 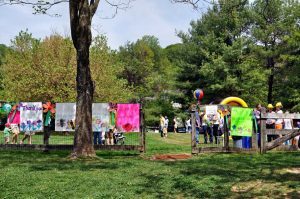 When May arrives in Chester County, people from the area know that it is time once again for West Chester’s Annual May Day Festival. 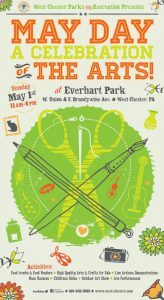 West Chester’s “May Day Festival – A celebration of the arts” will be held on May 1 at Everhart Park (West Union Street and South Brandywine Avenue, 610-436-9010, http://www.west-chester.com/439/May-Day-Festival-of-the-Arts) from 11 a.m.-4 p.m. The list of attractions at the free event includes food trucks and food vendors, high quality arts and crafts for sale, live artisan demonstrations, moon bounces, children’s rides, outdoor art show and live performances. Live entertainment in the Performance Area will be include skits by West Chester Performing Arts Studio, The Magic of Keith Frye, West Chester Swing Kings and West Chester Dance Works.The line-up of strolling entertainment includes The Magic of Keith Frye, Palace Pool Cleaners, Tall Cedar Clowns, Lady Manipura, and Ryan Shiflet. Doctors and health-related organizations everywhere agree that everyone should be walking more often to improve their individual health — that walking is a good thing. On April 30, walking can also be a good thing for the animals of the Chester County SPCA. That’s because Sunday is the day for the Chester County SPCA’s 29th Annual Walk for Paws at West Goshen Community Park (1025 Paoli Pike, West Chester, 610-692-6113, www.ccspca.org). The Walk for Paws is one of the Chester County SPCA’s most important fund-raising events. All proceeds benefit animals, programs and services at the Chester County SPCA. Because fund-raising is the goal, the organizers encourage everyone to gather pledges and win prizes. This year’s Walk for Paws combines the traditional walk with festival fun for everyone in the family. Festival events include a pet costume contest and introductions to the SPCA’s adoptable animals. Activities geared for youngsters include face painting, kids’ games and live entertainment by the Chatter Band. There will also be games such as games like gladiator jousting and bubble bowling. And, there will be a “Beer Garden” and food trucks for those who get hungry or thirsty. This year’s Walk for Paws event, which will also include a 5K Run in addition to the traditional mile-long walk and family-friendly outdoor festival. Participants can also register in person on the day of the event. Registration for the 5k run opens at 9 a.m. and the race begins at 9:30 a.m. Registration for the mile-long walk opens at 9:30 a.m. and walkers depart at 11 a.m.
Fairville Friends School hosts the Fairville Fun Fair, which will be held April 30 from 11 a.m.-3 p.m. 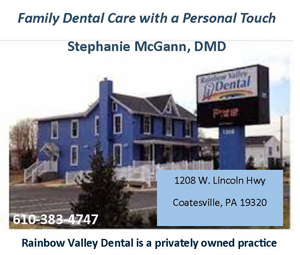 Visitors are invited to the Fairville Fun Fair, which will be held April 30 from 11 a.m.-3 p.m. at Fairville Friends School (216 Pond View, Chadds Ford, 610-388-1268, http://www.fairvillefriends.org). Held on the school’s grounds, Fairville’s Fun Fair is especially great for families with toddlers, preschoolers, and young children with activities such as pony rides, moon bounces, cookie decorating, digging for treasures in a giant sandpit, arts and crafts, and even riding on a tractor. The Fun Fair also offers live entertainment and healthy lunch fare will be available for purchase. The Fair is open to the public with no entrance fee. In case of rain, the Fair will be held on May 1 at the same time and location. Malvern Blooms (downtown Malvern, 484-321-3235, http://www.malvernbusiness.com/events/6/2015-malvern-blooms-festival), one of Chester County’s popular early spring events, will be held May 1 from 11 a.m.-4 p.m..
On this special day, the Borough of Malvern will be hosting a large array of juried artists, home and garden vendors, entertainers and crafters. The event will take place along King Street, on Warren Street and in Burke Park. The street will be lined with booths, exhibits and sales displays presented by artists, local store owners and food vendors. Malvern Blooms, which has become an annual tradition in Malvern, will also feature a “Field Day” in Burke Park, live musical entertainment by the Slicked Up 9’s, and an array of activities for kids including rides on the Malvern Express Kiddie Train, a “race for glory on the inflatable Dashing Derby, and exploring the Tropical Funhouse. The Sly Fox Bock Festival and Goat Race is Sunday. 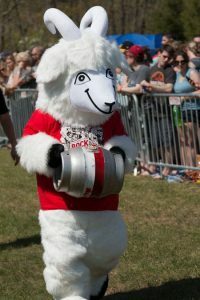 On May 1, Sly Fox Brewing Company (331 Circle of Progress Drive, Pottstown, 484-300-4644, http://www.slyfoxbeer.com) is hosting its Sly Fox Bock Festival and Goat Race. Bock Fest runs from 11 a.m.-6 p.m. and the brewery’s tasting room will remain open until 8 p.m. The Goat Race starts with the first heat and 2 p.m. and the competition lasts approximately two hours. The competitor that finishes as Goat Race champion goes down in history. The name of the brewery’s Maibock is named after the winning goat and ceremoniously tapped directly after the conclusion of the race. In recent years, the event has featured between 40 and 60 registered goats. Some of the entrants this year are Goose, Crafty, Blue Hazel, Wild Bill, Tosh, Marley, Slippery Pete, Sundae, man, Chevre, manbearPIG, Ragnar Lothbrok, Beeryard, Sawyer and Vincent Van Goat. Admission to the event is free and portions of the day’s proceeds benefit both Pottstown PAL and the Brandywine Valley SPCA. 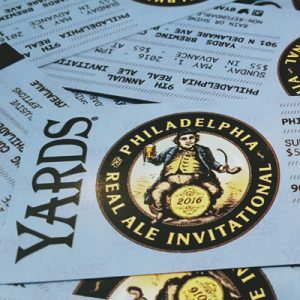 Also on May 1, Yards Ninth Annual Philadelphia Real Ale Invitational will be held from 1-5 p.m. at Yards Brewing Company (901 North Delaware Avenue, Philadelphia, 215-634-2600, http://yardsbrewingcom.ticketleap.com,). This year’s festival will feature more beers than ever before, with over 50 firkins from breweries all over the country — and overseas. Cask ale (or real ale) is unfiltered, unpasteurized beer that carbonates naturally inside a cask rather than using nitrogen or carbon dioxide pressure. This brewing method originated in England, and Yards helped resurrect the style in Philly 20 years ago with its Extra Special Ale. Each guest will receive a commemorative glass and guide to the day’s festivities. There will also be food and music aplenty. There will be food and continuous live music to go along with the huge array of fine ales stationed throughout the brewery. The event will be held rain or shine and guests must be 21 or older to attend. Tickets are $55 in advance and $65 at the door. The Fifth Annual Center City Jazz Festival (http://ccjazzfest.com/), which is the closing event of the month-long “Philly Celebrates Jazz,” is scheduled for April 30 from 1-7 p.m. and one ticket allows participants to have access to all 20 bands that are scheduled to play throughout the day. The popular annual festival will feature six hours of live performances at five downtown locations which are all within walking distance of each other. 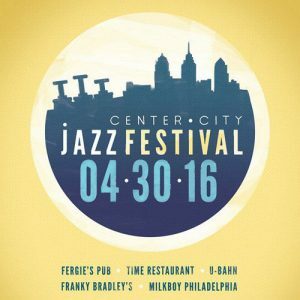 The Center City Jazz Festival will take place at Fergie’s Pub, Franky Bradley’s, U-Bahn, Milkboy Philadelphia and Time. Philadelphia has an extraordinary jazz heritage, beginning with Ethel Waters and extending to John Coltrane, Billie Holiday, Joe Venuti, Eddie Lang, Stan Getz, the Heath Brothers, Dizzie Gillespie, Sun Ra, McCoy Tyner, Grover Washington Jr. and other music luminaries, all of whom set the stage for the vibrant jazz scene the City still enjoys today. The goal of Philly Celebrates Jazz is to further stimulate the current jazz scene and encourage people of all ages to participate and support institutional jazz programs. The line-up for Fergie’s Pub includes Mike Cemprola, Nasir Dickerson, Ideal Bread and Chris Oatts while Franky Bradley’s will be featuring the Kimmel Center’s Creative Music Program, Three Oranges, Josh Evans and Orrin Evans & the Captain Black Big Band. The acts slated to play U-Bahn are Chrome Els, David Gibson, Killiam Shakespeare, and Tim Green. Milkboy-Philadelphia will host Ryan Keberle, Anna Cecilia, The Jost Project and Gretchen Parlato & Taylor Eigsti and Time Restaurant will present Anibal Rojas, Masami Kuroki, Muscle Tough and Brandee Younger. Tickets for the 2016 Center City Jazz Festival are $15 in advance and $20 day of show. In conjunction with the celebration of Historic Philadelphia’s 10th anniversary at Franklin Square (200 Sixth Street, Philadelphia, www.historicphiladelphia.org ), Historic Philadelphia is illuminating the park with its inaugural Chinese Lantern Festival. 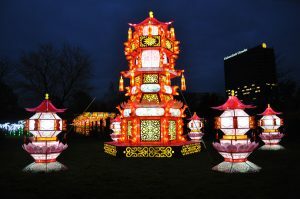 Now through June 12, Franklin Square will come alive every night with 25 illuminated lanterns, handcrafted giant flowers, a three-story pagoda and a 200-foot-long Chinese dragon. All creations were constructed by lantern artisans from China. Chinese-inspired performances will take place in Franklin Square twice nightly. Performances, which celebrate Chinese performance art and entertainment, are 30-minutes long and are scheduled for 6:30 and 8:30 p.m. Sunday through Thursday and 7 and 9 p.m. on Friday and Saturday. Festival hours are 6-10 p.m. Sunday through Thursday and 6-11 p.m. on Friday and Saturday. Admission is $17 for adults, $12 for youth, and $15 for seniors and military. On April 30 and May 1, the Greater Philadelphia Expo Center (100 Station Ave., Oaks, 484-754-3976, http://events.brickfestlive.com) will host Brick Fest Live from a10 a.m.-6 p.m. on Saturday and 10 a.m.-5 p.m. on Sunday. Brick Fest Live is a fan festival for LEGO® enthusiasts of all ages. Visitors will be able to check out outrageous creations made entirely of LEGO® bricks and see how these little plastic bricks open up a world of imagination and creativity. The event offers opportunities to get inspired, educated, and entertained with LEGO bricks. Visitors can play with huge attractions built to set the imagination free. The list of attractions and activities includes Brick Wall, Models, Glow Zone, Golf, Mosaics, Red Bricks, Junior Builders, Inspiration Station, Mascot, Theater, Derby, Reading Rest, Video Games and Shopping. Video link for Brick Fest Live — https://youtu.be/0KcPwQtWOVs. Admission to Brick Fest Live is $22. The Yellow Springs Art Show, which is still free and open to the public, is celebrating its 43rd anniversary this year. The popular annual event now features more than 185 participating artists — including 23 artists who are new to the show this year. The show is running now through May 8 in Historic Yellow Springs Lincoln Building (Art School Road, Chester Springs, 610-827-7414 or www.yellowsprings.org). Show hours are from 10 a.m.-4 p.m. daily. The 2016 Yellow Springs Art Show will have on display over 3,000 pieces of fine art in a wide range of media and styles – oils, watercolors, bronze sculptures, pastels, landscapes, still life, three-dimensional works, seascapes and abstract. This year’s Poster Competition winner is “Autumn Glory” by Jim McFarlane. All proceeds benefit arts education, environmental protection and historic preservation of the 300-year-old village of Historic Yellow Springs. If you’re wondering what’s in bloom right now, featured in the Gardens is “Princess-tree.” This deciduous tree native to China, produces large, fragrant, panicles of lavender flowers in the spring. The wood of this fast growing tree is highly prized and used to make furniture and musical instruments. Also in the spotlight now in the Cow Lot are Weeping Birch, The Gardener’s Tree and Flowering Japanese Dogwood. The Ardensingers are performing Gilbert & Sullivan’s “H.M.S. Pinafore” now through April 30 at their historic Gild Hall (2126 The Highway, Arden, Delaware, 484-319-2350, www.ardensingers.com). Also known as “The Lass That Loved a Sailor,” the piece is a comic opera in two acts. The story takes place aboard the ship HMS Pinafore. Performances are scheduled for April 29 and 30 at 8 p.m. and April 30 at 2 p.m. Tickets are $20 for adults, $17 for seniors and $7 for children.